This is Part Two of an exclusive report from inside the BAFTA/LA Awards. Click here for Part One. All pictures are also exclusive. The next award was The Stanley Kubrick Britannia Award for Excellence in Film. 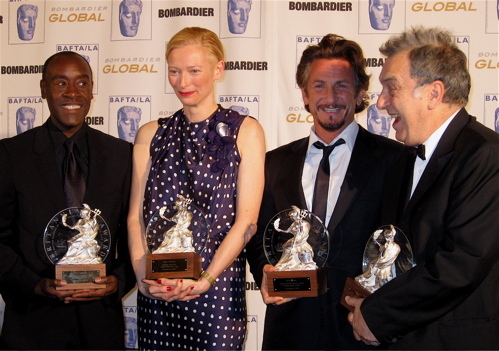 This was presented to Sean Penn with introductions by Patricia Clarkson and then by director Paul Thomas Anderson. In a moving tribute, Clarkson read a self-written ode. “He has raised American acting to a whole new level by not acting at all. There is beauty to his raw truth. Watching him, one may encounter everything from beauty, darkness, light, unpredictablity. He’s like the weather!” exclaimed Clarkson. She added, “He looks into your eyes and feels what you’re feeling.” It was at this point that I remembered Penn’s greeting to me earlier in the evening. I was genuinely happy to see him. Evidently, he knew it and acknowledged it. It was a circular moment for me. After Clarkson’s speech, many clips from Penn’s career were shown. The obvious clips from Carlito’s Way, Fast Times at Ridgemont High, Dead Man Walking, I am Sam and Mystic River were strewn in with appearances from television shows like Friends and Ellen. One of the loudest rounds of applause was for a clip from the Penn-directed/written film Into the Wild. After the clips, director Paul Thomas Anderson approached the stage, stating he was shocked that a clip from Shanghai Surprise was omitted. Penn laughed from his seat. Then Anderson continued by describing Penn’s humanity. “Yesterday, he was in Venezuela, today he was in New Orleans, and tomorrow he will be in Cuba,” Anderson informed us. As Penn approached the stage, he received the only standing ovation of the evening. True to form, he was humble and in complete gratitude, making remarks about the positive outlook of the presidential election. After his speech, he exited the stage. Host Harry Shearer made closing comments, the lights came up, and the ceremony came to a close. WOW! I feel like I was there! Thank you for sharing the information/write-up. PS. I also love the candid photos of Sean Penn grinning vs. the stale “posed” shots that celebrities give. Candid shots are the way to go!